OURS IS SOLIDARITY AND STRUGGLE. 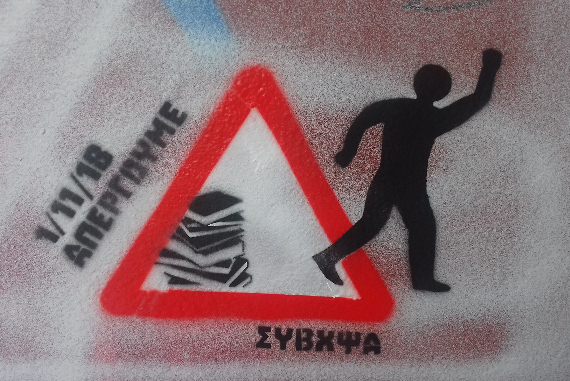 The Media Corporation Lambrakis (DOL), the owner of the publishing house <<Ellinika Grammata>> ,is proceeding with the mass firing of 100 employees. Thus it has announced the closure of one of the largest publishing houses in the country. DOL is a powerfull corporation witch is involved in the press sector, book publishing and the mass media (television,radio,newspapers,magazines,publications,multimedia). It is a corporation with an important presence, several decades now, in various games of power. It always supports the two ruling neo-liberal parties (»socialists»-conservatives) and has enjoyed open-handed state investments and other privileges. DOL self-promotes itself as a »pillar» of education,the arts and culture. 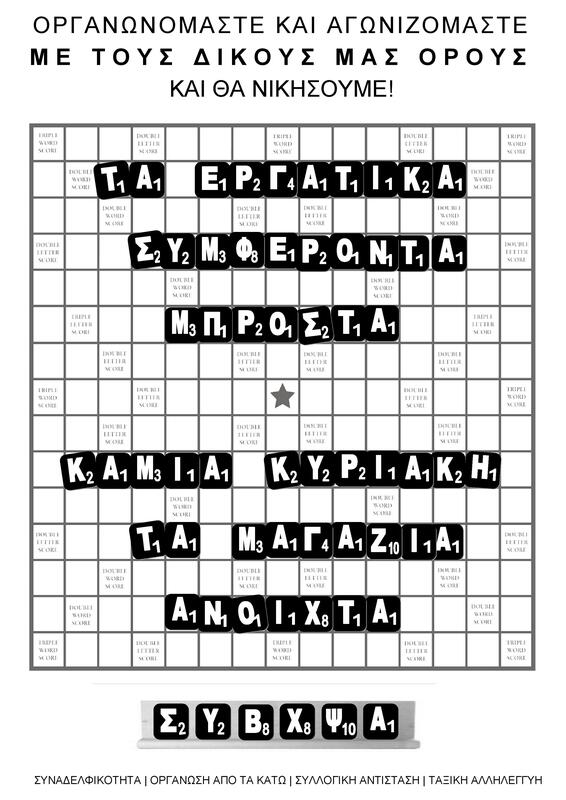 It plays a leading role in the orientation and operation of the ‘Megaro Mousikis’. 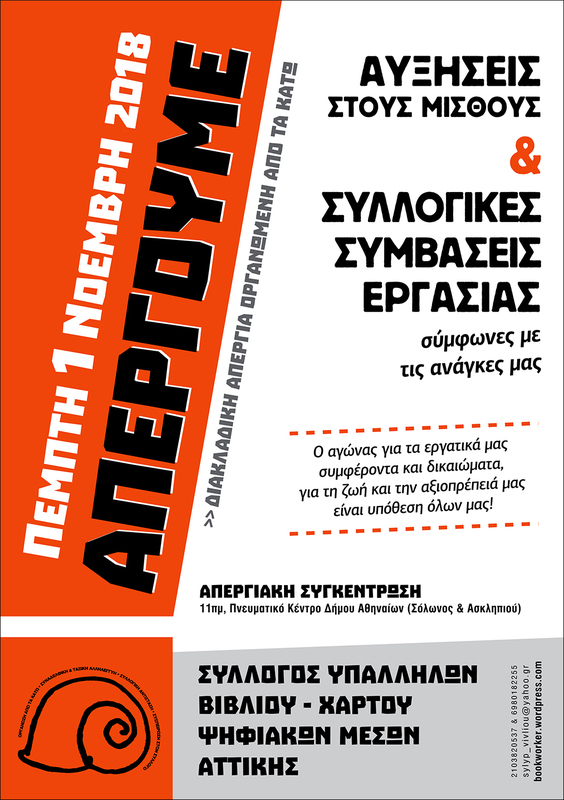 A distinguished events hall in Athens and Thessaloníki. At the same time it continues with great »eagerness» the sponsoring of several cultural events, a fact that it takes great care to promote by any means possible. 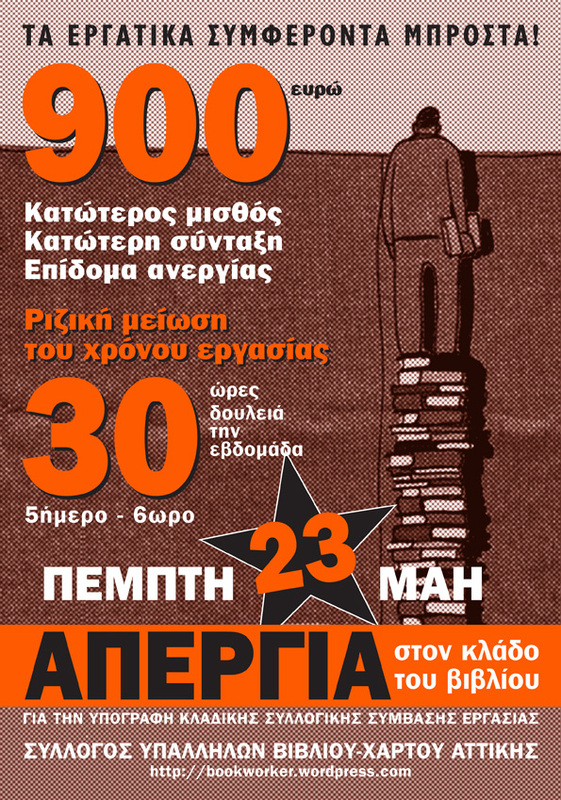 This development in addition to the tens of firings in the book related sector, shows the vicious anti-worker face of the »measures» against the crisis. It proves that the crisis is going to be payed by all of us, at the same time as tens of laws and measures are taken to support and save employers, at the same as millions of euros are being given to banks, at the same time as support measures such as tax allowances and new laws favourable to capital are provocative. The government and the bosses know very what they are doing. 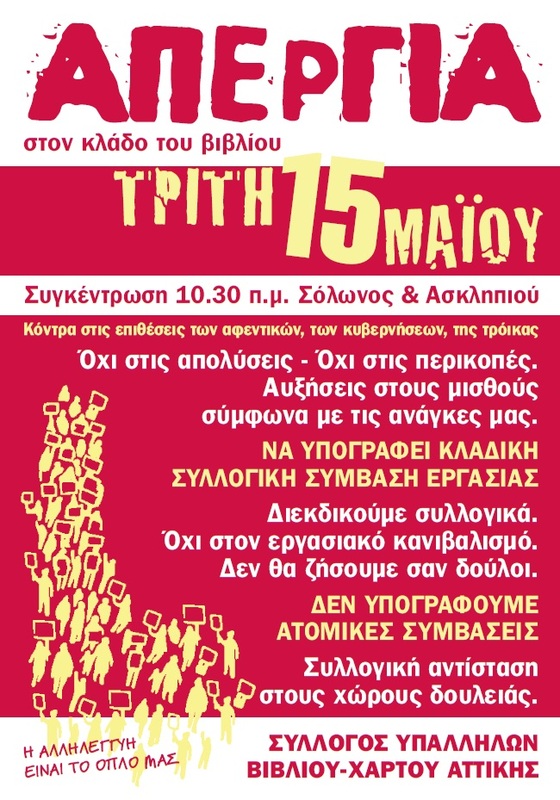 They have a plan and a target, amidst the turmoil of the crisis, to not let any workers rights standing, to ‘end with them all now’ and with whatever was an obstacle to them. The bosses sack workers, shut down businesses,abolish labour agreements and lower wages. Profits must stay profits ! The closing down of ‘Ellinika Grammata’ is further proof of all this. About 100 workers are being thrown onto the street . Creating problems for various kinds of colleagues working in association with publishing houses: writers,translators, editors etc. This has happened at the same time as one of the largest shareholders of DOL, mister Psiharis , has bought a large percentage of the FMPG bank. 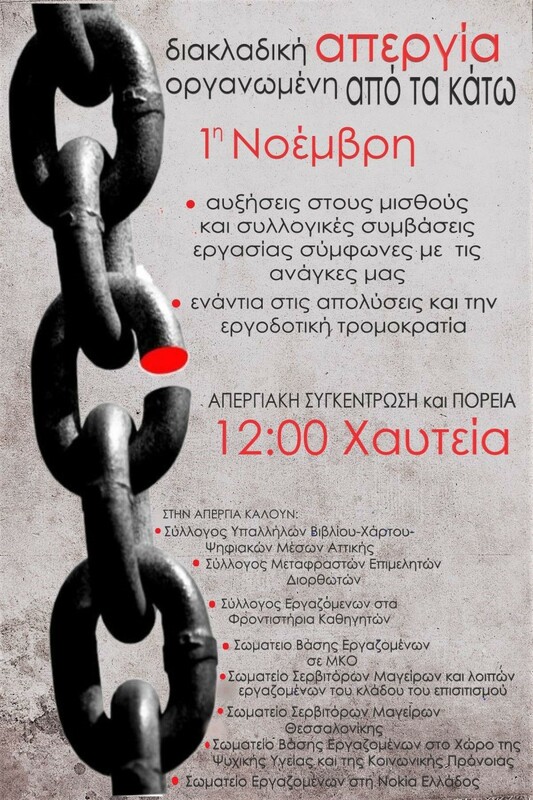 The Media Corporation Lambrakis, this »national sponsor» of…culture, with one cynical announcement informed the employees that within 10 days (!) they will loose their jobs. This is fully in tune with the spirit of the EU memorandum and government policy. In its announcement DOL refuses any kind of discussion over the protection of job placements but also any written obligation to fulfil its duties. In this way the road is open for similar anti-worker policies across the book sector. 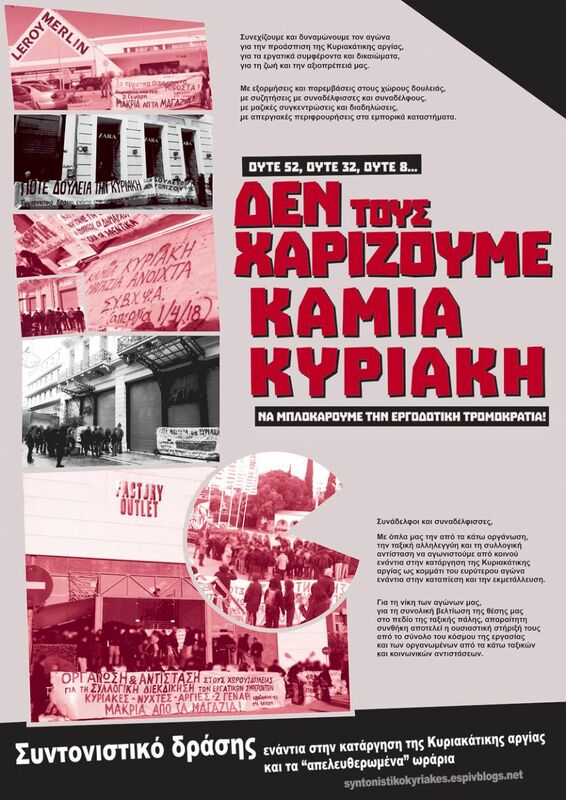 The Workers Union in Publications, Bookstores, Photo Copy Centers, Stationery of Attica (Athens-Greece) supports unanimously the decision of the assembly of the employees at »Ellinika Grammata» who are not in agreement with the closure of the company. 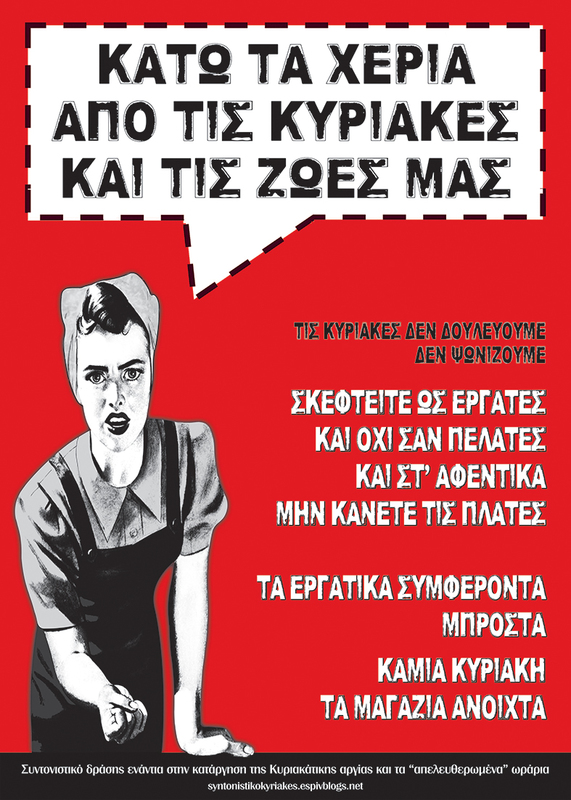 We stand by the employees of the company and their shop floor union at ‘Ellinika Grammata’, with all our forces we demand that all job places are secured and that all the conventional obligations of the company are met. The employees are not to blame for the fall in the profits of the shareholders of DOL. The employees refuse to pay for mismanagement or the mistakes of previous and current managements. With our militant decisions and our mobilisations and with our struggle we will overthrow the barbarous future of job dismissals and unemployment. IT WILL NOT PASS ! 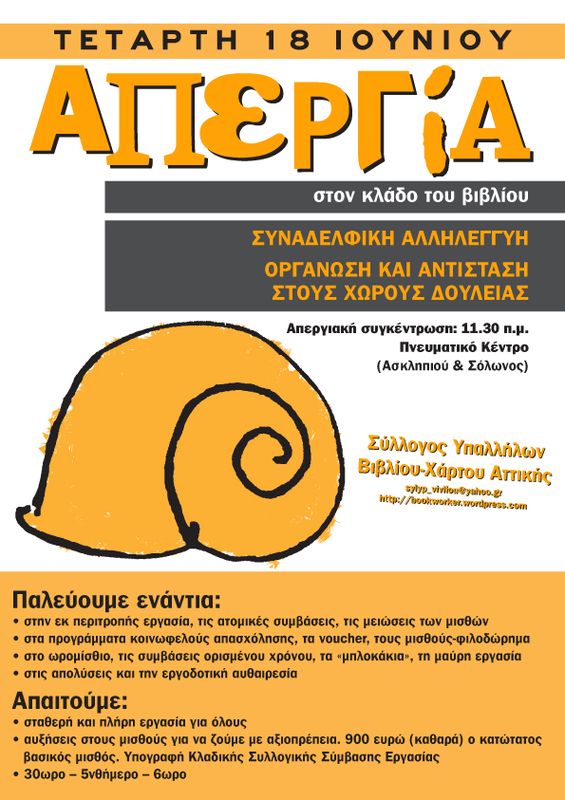 – Send messages of protest at the personal email address of the staff at »Ellinika Grammata’ (iloukatou@dolnet.gr), with regards to its choice to chuck 100 workers onto the street. 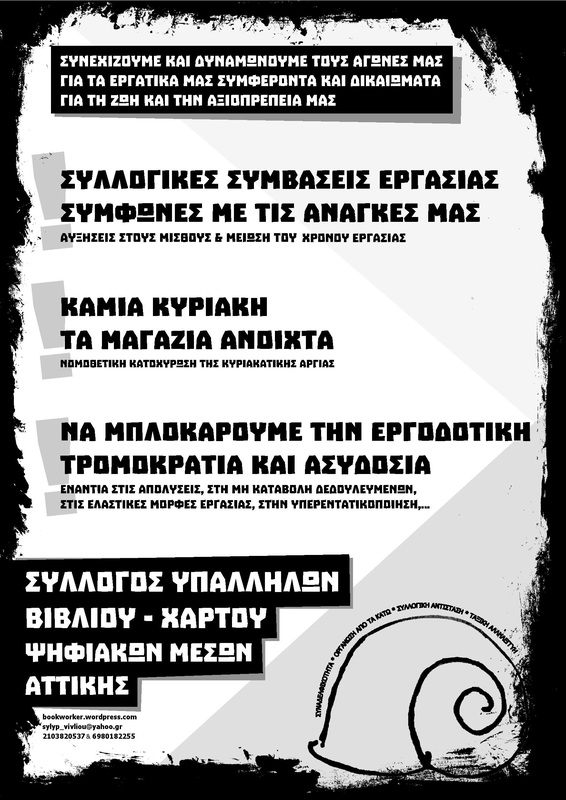 Forward these messages to our unions email (sylyp_vivliou@yahoo.gr).